Less than a week into July and we have already celebrated two big occasions in our house, the Fourth of July and our pup Maggie May’s 3rd birthday! If you would have told me three years ago that I would be throwing puppy parties and baking dog-friendly cakes today, I would not have believed you. I never had pets growing up, except for the occasional short-lived goldfish, so I never really understood the close relationship you could develop with a four-legged friend. My two pups are a huge part of my family now and I could not imagine life without them! Nothing is better than coming home to those crazy wagging tails! I think it is safe to say that I have become a true dog lover, maybe even one of those “crazy dog ladies”. And I wouldn’t have it any other way! Start by emptying the contents of a 14.5 oz. can. Wash, rinse and dry completely. Carefully remove the top lid as well as the lip directly under it (removing the lip helps the cake to easily pop out after baking). 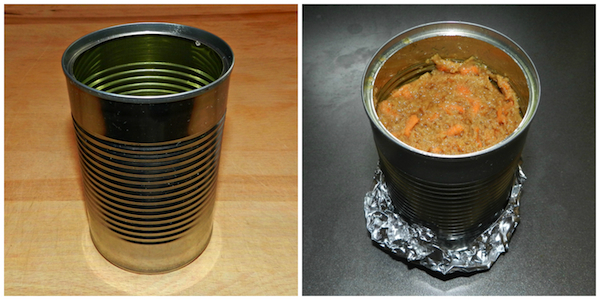 Coat the inside of the can liberally with non-stick spray and wrap the bottom with tin foil. Place the can on a baking sheet and set aside. Preheat your oven to 350 degrees. In a mixing bowl, combine the egg, peanut butter, oil, vanilla, and honey. Blend well. Stir in the carrots and mix thoroughly. Sift flour and baking soda together and fold into batter. Fill the prepared can a little over 3/4 of the way full with the cake batter. As the cake bakes in the oven, it will rise above the top of the can, which you can remove later before decorating. Bake for 35-40 minutes or until cooked through. Remove from the oven and let cool completely. Once cooled, turn the can upside-down and gently shake until the cake pops out. Trim the top of the cake, if desired, to get an even surface. Adhere carrot-coin polka dots by smearing a small amount of creamy peanut butter on back of each and pressing firmly onto the cake. Use additional peanut butter to frost the top of the cake. Add a Beggin’ Strip brand dog treat, bone shaped dog food pieces and candle on top to finish of the decorations. Maggie loved her birthday cake! Between her and Bogey, they had it gobbled up in no time! Happy Birthday Maggie May! One of our two little pups, Bogart, celebrated his first birthday this past weekend. We adopted him as a puppy from a local animal rescue when he was only 12 weeks old. He was my first puppy (our second pup we adopted as an adult), so it has been such a fun experience watching him grow and learn over the last year. I decided to make him a special treat for his big day. These “Pupcakes” are a Pretty Little Pastime, your four-legged best friend will definitely approve of! 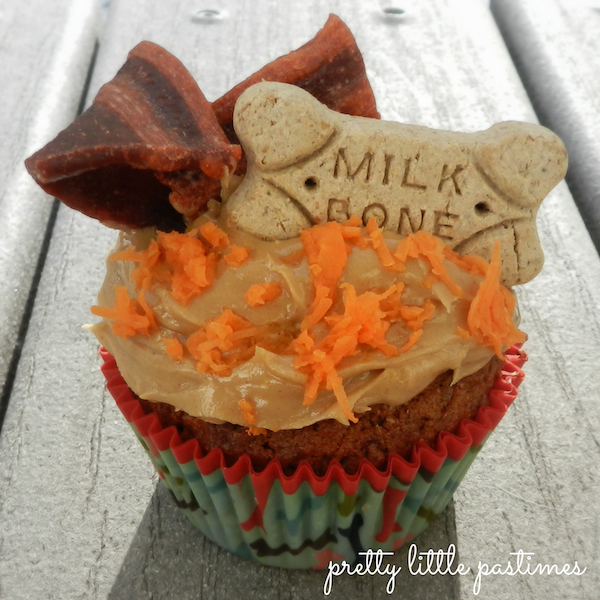 I reserved extra peanut butter and shredded carrots to top my pupcakes. I also used Milk Bone brand treats and Beggin’ Strips to finish decorating. Preheat your oven to 350 degrees. In a mixing bowl, combine the egg, peanut butter, oil, vanilla, and honey. Blend well. Stir in the carrots and mix thoroughly. Sift flour and baking soda together and fold into batter. Fill 6 lined cupcake molds 3/4 of the way full with the batter. Bake for 20 minutes (35-40 minutes if making one full cake) or until cooked through. Remove from the oven and let the pupcakes cool completely before frosting. Once cooled, spread peanut butter over the tops of the pupcakes and top with remaining carrot shred “sprinkles”. Break a Beggin’ Strip in half and push one side firmly into the cake to keep in place. Add a Milk Bone treat in front of the strip and your pupcakes are ready to be served! 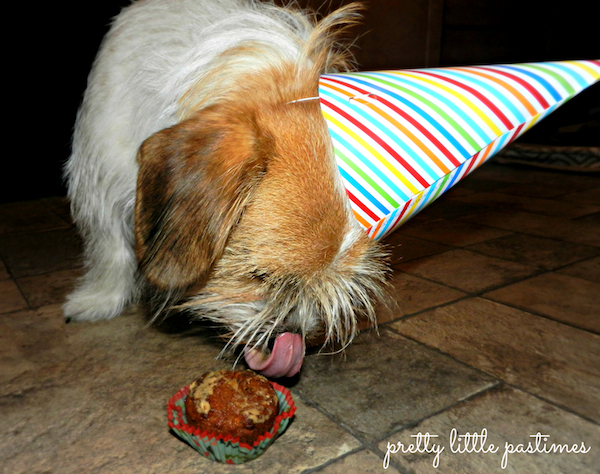 Bogey loved his birthday pupcake and just like most kiddos he took the time to lick off all the frosting first! I made sure to remove the wrapper before he started on the cake also. 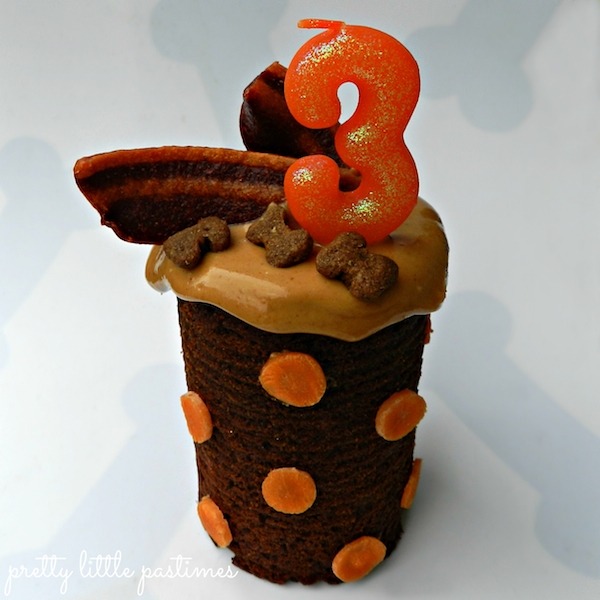 This recipe only makes 6 pupcakes, which is great for a little birthday treat, and can easily be doubled or tripled if you are having a bunch of party animals over. It is sure to get all of their tails wagging! 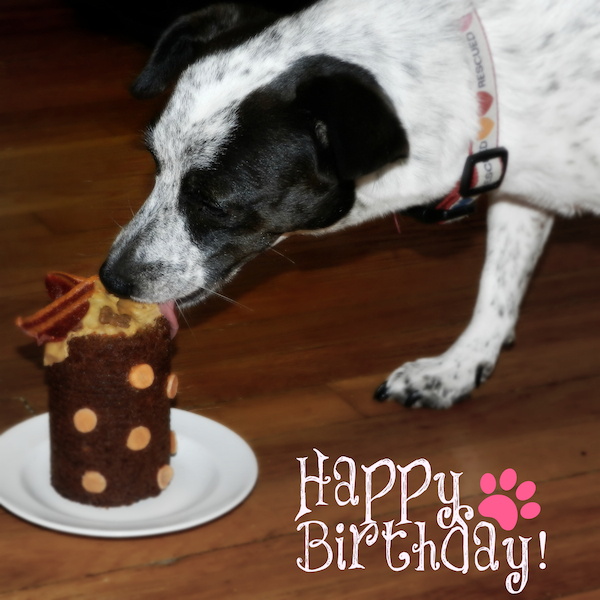 Check back for more on our Doggy Birthday celebration.